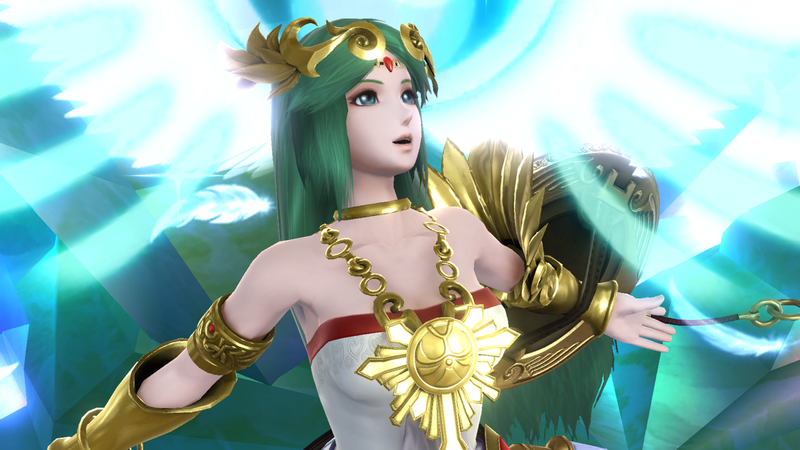 In spite of being a goddess, Palutena has very few advantages in the current metagame. Her jab is fast and inflicts decent damage, while her tilts are slightly stronger and have lasting hitboxes. Palutena’s recovery potential is also above average. But really, that’s about it. These traits might seem underwhelming, but that’s because Palutena is an underwhelming character. As you might expect, Palutena has several flaws holding her back. Her attacks are slow: her smashes are among the most sluggish in the game, and are not strong enough to compensate for their low speed. Since Palutena’s most powerful moves suffer from high startup lag, she often struggles to KO opponents. 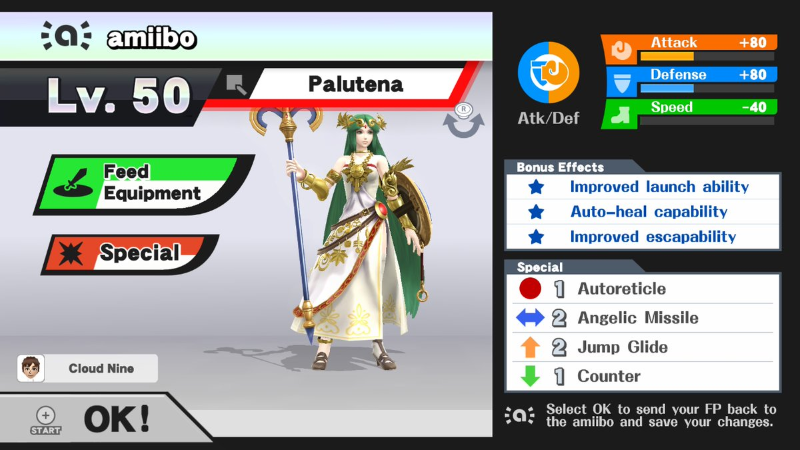 Palutena’s amiibo also has a few odd tendencies in its AI: most significantly, it will never use its Counter move. No matter how hard you try, Palutena will never use it, no matter what. Palutena is an extremely difficult character to train. Her weaknesses outweigh her strengths, and it’s honestly sad that a “goddess” is entirely outmatched by an oversized ape. 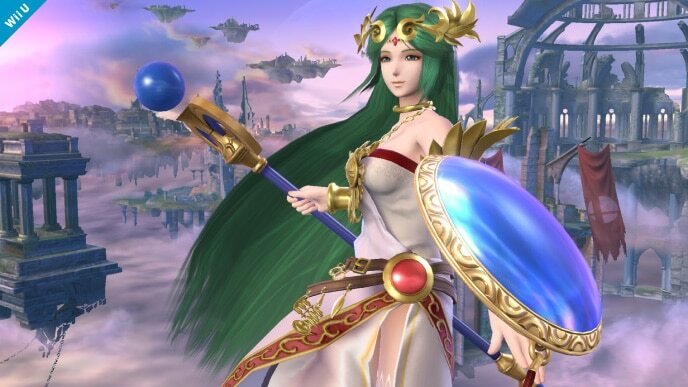 Regardless, you will need a lot of patience to train this fighter, which will be especially tricky without the aid of her Counter move (if Palutena would use it, she’d at least be decent). Angelic Missile: This is a custom version of Palutena’s side special. 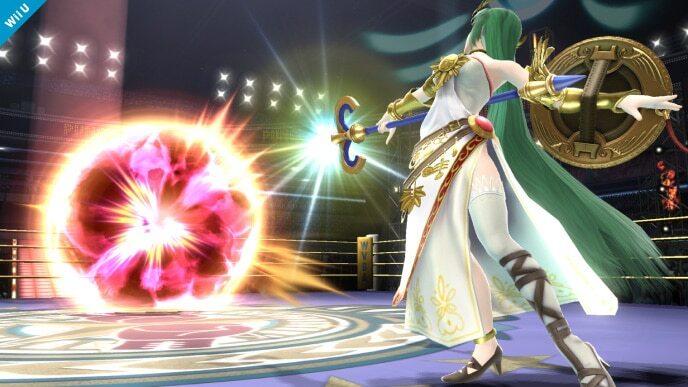 For some reason, Palutena’s amiibo uses its Reflect move at random: equipping it with Angelic Missile prevents this from happening. Jump Glide: This is a custom version of Palutena’s up special. Of all Palutena’s recovery options, Jump Glide is most optimal due to its balance between horizontal and vertical distance. Neutral options: jab, forward tilt, down tilt, and neutral special. Palutena’s jab is good at racking up damage on its own. This trait is supported by Palutena’s tilts. Although they’re slow, they have lasting hitboxes that can catch foes off-guard. Autoreticle is a useful three-hit projectile helps apply shield pressure. Main KO moves: up smash. All three of Palutena’s smash attacks are slow and tough to land, but Palutena’s up smash is the least slow and tough to land. It lacks horizontal range but has huge vertical range. Forward smash is another option for grounded opponents: just be wary of its startup and ending lag. Thanks to Blue, Supernova, and Dreamy Jay for compiling Palutena’s information. Images are courtesy of SmashWiki and the official Super Smash Bros. website.